Recovering sparse measures from their low frequencies. Total variation in image processing. Variational approaches to denoising, structure-texture decomposition,... . Using self-similarities in images to perform restoration. I am currently a researcher at INRIA in the Mokaplan team. My research interests include applications of the calculus of variations and the geometric measure theory to signal and image processing. I am also interested in the applications of variational methods for computational mechanics. I defended my PhD thesis in June 2011 at TELECOM ParisTech, under the supervision of Yann Gousseau and Jean-François Aujol. Paul Catala (co-supervised with G. Peyré). 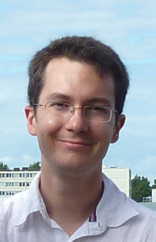 Quentin Denoyelle (co-supervised with G. Peyré, defended in July 2018). (30/11/2017) Our Monge Ampere solver for optimal transport is available on the INRIA Forge! (09/03/2016) Our project CAVALIERI has been renewed! See the webpage of the project. (21/03/2015) Our project CAVALIERI (with Charles Dossal, Nicolas Papadakis, Julien Rabin and François-Xavier Vialard) has been accepted by CNRS. (10/02/2014) I have been selected for the Vicent Caselles Student Award at SIAM Conference on Imaging Science.